This product requires the base game Europa Universalis IV. Weakened by wars on the continent, with a feeble monarch and rapacious nobles, England in the mid-15th century had no inkling of the glories to come. It would be a difficult path, through civil wars, religious upheaval, great fires and awkward unions. But the nation that would become Great Britain would rule a trade empire that spanned the globe, exporting ideals of English freedom - both of thought and trade - while making itself the most powerful nation the world had yet seen. Master wind and trade, and spark industrial revolution in Rule Britannia, a new Immersion Pack for Europa Universalis IV. New British Missions: New exclusive decision trees for England, Scotland and Ireland, embedded in our new Europa Universalis IV mission system. Industrial Revolution: Highly developed provinces may produce coal in the late game, fueling higher productivity and greater wealth. Innovativeness: Earn rewards for being the first nation to unlock new knowledge, including lower power costs. Naval Doctrine: Adopt a general strategy for your fleets, giving you bonuses to ship maintenance, trade power or battle performance. Anglicanism: A new Protestant faith can appear in England with new bonuses and religious choices. Knowledge Sharing: Help your lagging allies or subjects by promoting the spread of institutions in their realms. New Unit Pack: New army designs for British nations, including regional Irish units and revolting nations like Northumberland or Cornwall, as well as new music. New Music: Our composers have been hard at work writing new songs to quiet the stormy seas of commerce. 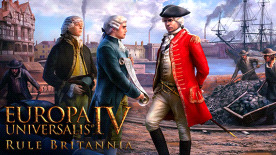 Please note: This content requires the base game "Europa Universalis IV" in order to play.